I have noticed that many of my friends have stopped making New Year's resolutions. Resolutions have been replaced instead by choosing a word for the new year; a word that a person wants to be the theme of their life. I like this practice better than resolutions mostly because it's not setting yourself up for failure. These word choices are motivated by an endless variety of life experiences and goals. I can not speak into the motivation of your word choice. Each of us must reflect on our own goals, successes, and even failures as we choose our word for this next year. I started choosing a word for the new year back in 2013. While I can not speak into your word choice, I can share the lessons I have learned though living through this process myself. The times I prayed about the word choice God used it to prepare me for circumstances that I could never have seen coming. We may choose our word for the year, but God will choose how that word plays out in our life. The year I chose "wisdom" as my word was the year that I had to make a lot of huge life changing decisions, decisions that I never expected to make in the January before when I had picked the word. The year I chose "security" was the year I had just wanted to be more confident in my skinny jeans, but instead God brought about the circumstance of a toxic family member trying to re-enter my life in order to challenge me to deal with all of the lies that I believed about myself, lies that had led to my insecurities. This toxic person had a warped view of who I was, and I had partially believed their view of me; I had to confront the person before I could confront the lies that kept me chained to insecurity. The year I chose "safe" ended up being a year full of battles; spiritual, emotional, and physical battles that God kept me safe in through his constant presence and protection. I had never felt more unsafe and scared than that year, yet I learned a new definition of what it meant it to be protected by God. The word you choose will not necessarily shape the circumstances of the next year, but it will shape your perspective inside of those circumstances. Don't feel like you need your perfect word January 1st. I recommend praying and just waiting for inspiration. The past few years I have not had my word until Mid January. 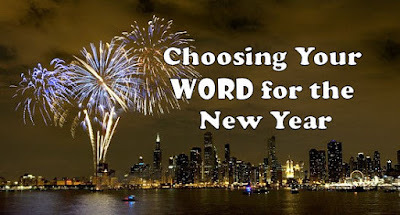 I wish you a Happy New Year, and may God prepare you for 2019 with a word that gives a small glimpse into His plans for your heart.